A special “shout out” to the Wagar Middle School in Carleton Michigan learning about Mt. St. Helens. 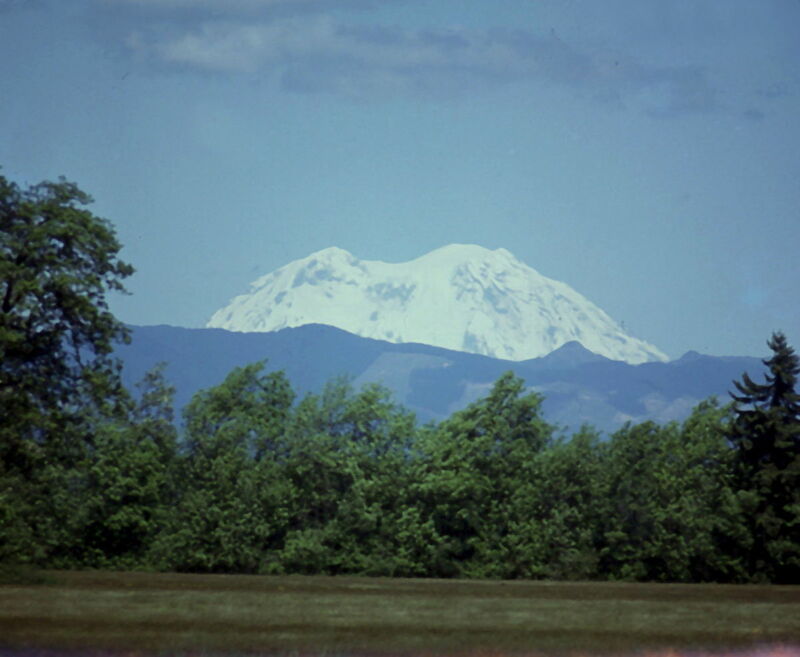 I had just moved to Seattle in January of 1980 and that summer Mt. St. Helens was in the news all the time. It was becoming active and the geologists were predicting it could blow anytime. I lived in Seattle about 90 north of the mountain. On a clear day I could see it from my apartment window.. 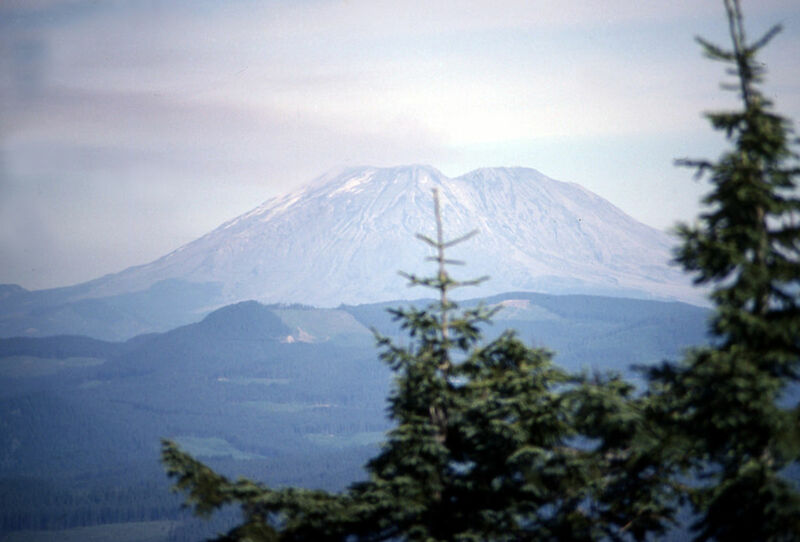 I was hiking in the Cascade Mountains roughly 110-120 miles north of St. Helens when it blew up. It sounded like sonic booms when a plane breaks the sound barrier. Because we were camping we did not understand that it was the mountain erupting until we met hikers coming up the trail later that day. One interesting tidbit was that people in Seattle did NOT hear the explosions like we did. Turns out the sound literally BOUNCED up into the atmosphere then back down to earth, then back up again, so there were places that heard the explosions and others that did not. They even heard it in British Columbia Canada! The day after the 1st BIG explosion there were smaller ones that I could see from my apartment. Sorry I can’t find that picture 🙁 but I vividly remember watching the ash shoot up into the sky from the mountain and could see the wind from the west (ocean side) push the ash towards the east. This first picture is from Interstate – 5 from the WEST, looking EAST. The next year I had joined 2 friends to hike the entire Pacific Crest Trail (PCT) from the Oregon border to the Canadien border. This trail walks right through the Cascade mountain ranged and up until the week before we left in late June, the section near Mt. St. Helens was closed off to hiking due to the devastation and ash. Then it opened up and we were the first people to walk on the PCT and we spent about 4 or 5 days walking through ash. Here is a picture of Mt. St. Helens from the EAST looking WEST. You can see the snow has mostly melted off compared to the above picture. 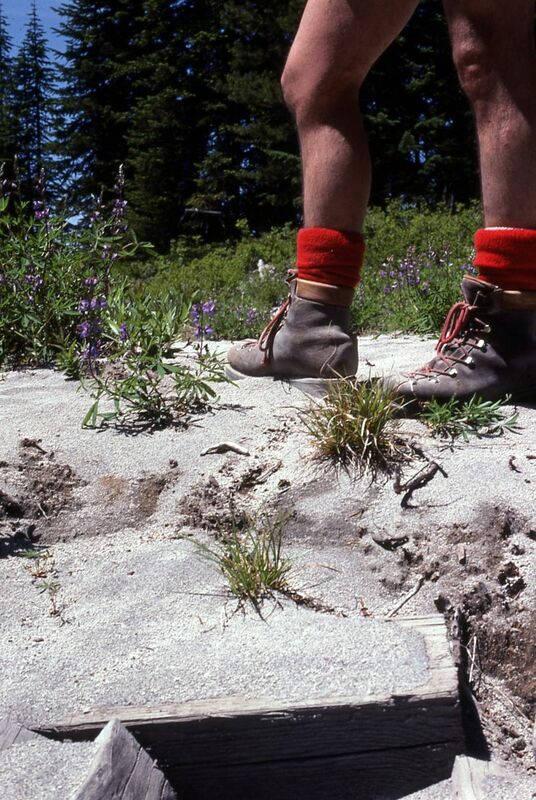 This final picture is taken of me in my hiking boots walking on the trail which is covered in ash. There were no birds in this entire section of the trail, no animals, no sound except for some wind thru the trees. It was very strange. The ash got into our boots, sleeping bags, tents, everything. When you get the ash I sent you, you can feel how fine it is. There are 2 different feelings to the ash. Put your finger in and you can feel that it is like the smoothest talcum powder you’ve ever felt. There are also little tiny pieces of rock in it as well that you can often feel. Anyway, I hope you enjoyed my pictures and a little of my story of how it was for me the year Mt. St. Helens erupted and also the year after when I walked through it. How did if feel when it erupted? Where you scared when it erupted? Why would you want to climb a volcano? What tools do you need to climb a volcano or a mountain? I was about 100 miles north of Mt St. Helens when it blew up and when the mountain erupted, the ash and destruction went East as that is the way the predominant winds blow. So we were never in danger. So we weren’t scared of the eruption, one because we didn’t actually know it had exploded. The camping I was doing was not technical climbing. We had backpacks on with our food and tents and supplies and we hiked on trails. Most of these trails are not steep, typically about 7-10% grade, so fairly easy hiking. The year of the explosion, we probably hiked in 5-8 miles from the road and set up camp for 2 nights. The year after the explosion was a much bigger hike. We started on the Columbia River which divides Oregon and Washington states and we hiked on the Pacific Crest Trail (PCT) for 400 miles towards Canada. We averaged about 15 miles per day on this trip and picked up a supply of food at 3 locations in our 400 miles. This took us 30 days of hiking and camping and we saw only a few people most days. The first 10 days we might of have seen 8-10 people but we saw NO ONE for the first week. Thank you Mr. Peacock for giving us so much information about Mt. St. Helen! What a treat to have someone share their personal experience with us here at Wagar Middle School. We also received the ash you sent us from the eruption. The texture of it was so soft and smooth. The students and myself felt honored to hear from you. Thanks again!! You are most welcome. I enjoyed digging up my old pictures and reliving those times in the Pacific North West.